Having worked his way through the club racing ranks, Ivan made his debut on the roads in 2008 and has concentrated his career here ever since. That first year saw him make an instant impression, particularly at the Manx Grand Prix on the Isle of Man where he finished second in the Senior Newcomers race, sixth in the Lightweight and 13th in the Junior. His versatility could also be seen around the Mountain Course with those results coming on a 750cc Suzuki, 250cc Yamaha and 600cc Suzuki. That year also saw him finish fifth overall in the 250cc Irish Road Racing Championship after a number of top six finishes. 2009 saw Ivan improve even further at the Manx GP with fourth in the Senior and fifth in the Ultra-Lightweight and he didn’t have to wait long for his first podium with third being taken in the 2010 Senior race. That year also saw him finish fifth in the Ultra-Lightweight and sixth in the Junior and he stepped up to the Isle of Man TT and International races in 2011. 2011 marked Ivan’s first year of competition at the Isle of Man TT and, concentrating on just the Supersport class, it was a move that paid dividends as he took 17th and 24th in the two races to win two bronze replicas. The following year saw him add a Supertwin machine to his stable of machinery and the latter gave him his best result at the 2012 TT meeting with seventh place. He improved greatly in the Supersport races too where he took a brilliant tenth in the first encounter, winning his first silver replica and recording his first 120mph+ lap, backing this up with 14th in the second 600cc race. It was more of the same in 2013 and, after taking an excellent fourth in the Lightweight TT race, Ivan took his first International race win when he defeated Jamie Hamilton and Lee Johnston in the Lightweight race at the Ulster Grand Prix. He also took fourth in the same race at the North West 200 whilst he was also recording regular victories now at Oliver’s Mount, Scarborough and the Southern 100. With backing from Taylor Lindsey Racing, Ivan added a Honda Superstock machine in 2014 and also had an ex-Cameron Donald 600cc Honda at his disposal, bikes which enabled him to edge ever closer to the top echelons of road racing. Indeed, a series of superb results at the TT, including a stunning seventh in the second Supersport race and 125mph+ laps on the big bike, saw him comfortably win the TT Privateer’s Championship. He was again victorious in the Lightweight race at the Ulster Grand Prix, where he also took a brilliant fourth in the Supersport race, and took his first podium, second, at the North West 200. He also won the prestigious International Gold Cup at Scarborough. Those impressive results saw him join RC Express Racing in 2015, who he’s remained with ever since, and that year saw him achieve his dream of winning a TT race, victory coming in the Lightweight race after a titanic battle with James Hillier where both riders posted the first ever 120mph+ laps in the class. Three more top fifteen finishes were taken on the island whilst he also recorded his first 130mph+ lap of the Dundrod circuit on his way to eighth in the Dundrod 150 Superbike race. Continuing with the team in 2016, Ivan duly added a second TT win to his collection with a dominant performance in the Lightweight race whilst he also took a fine tenth in the Senior race, recording a new personal best lap of the Mountain Course at 127.948mph. 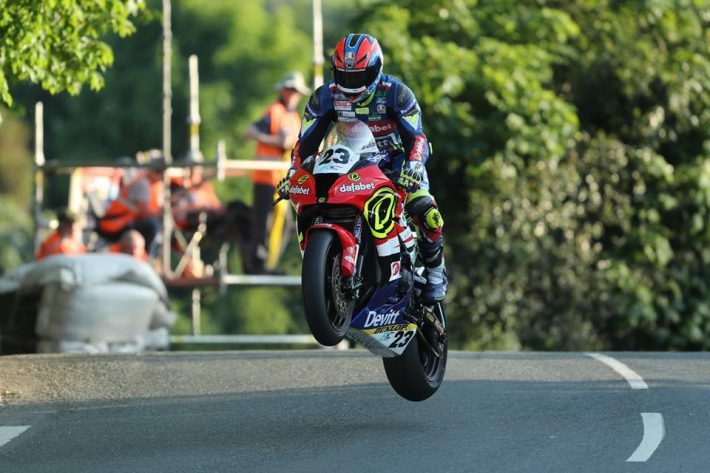 Earlier in the season, he took both Lightweight race wins at the North West 200 to further prove he was the number one exponent of the Supertwin machines whilst he matched his 2015 result at the Southern 100 with third in the feature Solo Championship race. Although 2017 wasn’t quite as good a year in the Lightweight class, Ivan took his third victory at the Ulster Grand Prix, finished third at the North West 200 and fourth at the TT. He was back in the top ten in the Superbike class at the Ulster Grand Prix, finishing ninth, and went one better in eighth in the Superstock race. He ended his year with a career-best 12th at the season-ending Macau Grand Prix. Ivan claimed his best ever Superbike finish at the 2018 Isle of Man TT when he took an excellent eighth place on the Dafabet Devitt Racing Kawasaki ZX-10R in the six-lap race, also setting a new personal best lap of 128.672mph. The Monday of race week saw Lintin claim two more top ten finishes with the Dafabet Devitt Racing rider taking ninth and tenth respectively in the four-lap Superstock and Supersport races, also setting personal best laps in each. Indeed, the Superstock race saw him break the 129mph barrier for the first time with a lap of 129.183mph making him, to date, the 25th fastest rider of all time around the 37.73-mile Mountain Course. Ivan and the Dafabet Devitt Racing team endured mixed fortunes on the Wednesday at the Isle of Man TT Races with a fine tenth place – his fourth top ten finish from as many races – and a lap of 124.913mph in the morning’s Supersport 600cc race offset by a retirement on lap two – when leading – in the afternoon’s Lightweight race. The Lincolnshire rider broke the lap record from a standing start with a lap of 121.603mph and lap two saw Ivan extend his lead as he looked well on course for a lap well in excess of 122mph. Indeed, when he reached Cronk ny Mona, less than two miles from the start and finish, his lead had gone out to almost ten seconds but, unfortunately, as he went round the next corner, Bedstead, the bike ground to a halt and his race was over. The Senior TT saw Lintin record another DNF, this time on the first lap at Ballacraine, after the belly pan was smashed off the bike. Overall, Lintin and the team came away from the TT with mixed emotions following what might have been in the Lightweight race but happy with their four top ten finishes and personal best laps in each class. 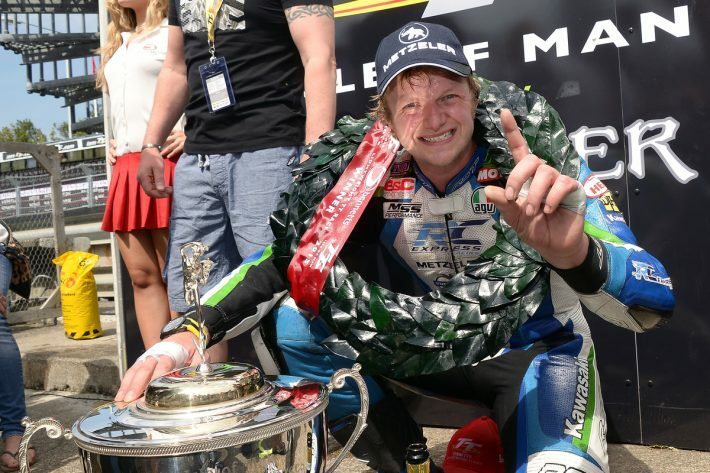 Lintin headed to the Southern 100 in great spirits following the success at the TT, and this showed when he won the opening Super Twins encounter and took a brace of second place finishes in two of the Superbike races. A fifth was taken in the third 1000cc race with fifth and seventh the outcome in the two Supersport 600cc races and he then took a career best second place in the feature Southern 100 Solo Championship race after twice finishing third in previous years. He also set a new personal best lap of the 4.25-mile Billown Course with a speed of 113.448mph making him the fifth fastest rider of all time. During the 600cc Challenge race, the final race of the week, Ivan was involved in a serious crash which saw him flown to Liverpool hospital in a critical condition. Thankfully, Lintin has made good progress in his recovery from the tragic incident and even made a guest appearance at Motorcycle Live 2018. We wish Ivan all the best in his recovery to full health. James Cowton sadly lost his life in the same collision and our thoughts are with his family and friends. Riders Jamie Coward and Mickey Evans were also involved, sustaining shoulder injuries and leg and arm injuries respectively but were soon back in race action. Recorded his best ever lap of the Mountain Course in the 2018 Superstock race, 129.183mph to become the 25th fastest rider of all time.